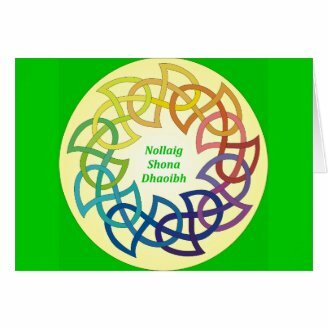 Ever wanted to say Merry Christmas in Gaelic to an Irish or Scottish friend? Or in Welsh to a Cymraes? How about Cornish, Breton and Manx? Our people do get about! With seasonal greeting cards, you don't even have to wrap your tongue around our languages yourself. It's already printed there on the card for you to hand over. The sentiment is there; the fear of mispronouncing a double L has gone. 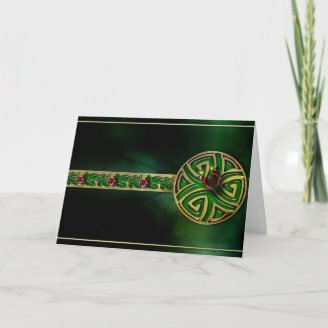 I've scoured the internet to find this collection of wonderful Celtic language Christmas cards. Enjoy! Breizh is a Celtic country that can be found on the northern coast of France. Famous for its festivals, music, cider and the Far Breton pudding (not all unrelated), you know that a good time is had in Breizh! It's the first place that we point to, when we make the point that not every Celtic country is in the British Isles! Ancient Amorica, now Bretagne or Britanny, is all the way across the Channel, marking a continental claim for the Celts. There's some evidence that it was a colony founded by Kenan Meriadoc, who sailed over from Britain. What is known for sure is that, as the Anglo-Saxons streamed across southern Britain, some displaced refugees fled across the Channel. They are Bretons now. Do you know a lovely Breizhiz? 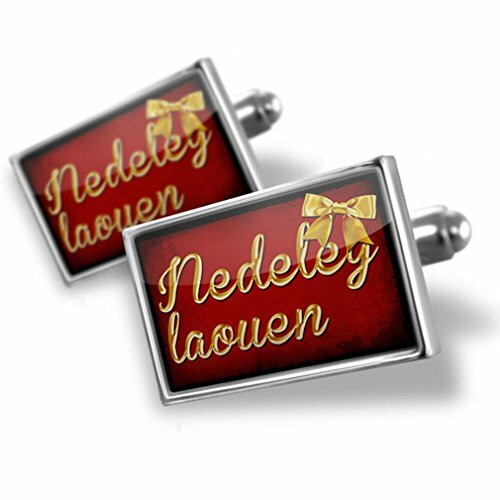 This Christmas you can tell them Nedeleg Laouen in a festive greeting card. What is Merry Christmas in Breton? 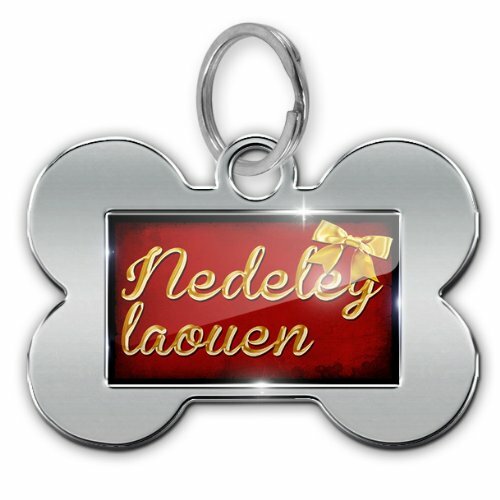 Nedeleg Laouen na Bloavezh Mat = Merry Christmas and a Happy New Year. How do you pronounce Merry Christmas in Breton? Ne-dee-leg low-wen nah blow-ves mat = Merry Christmas and a Happy New Year. 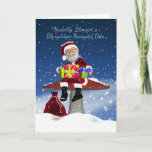 Hear Merry Christmas in Breton pronounced on Forvo, and Happy New Year in Breton on the same site. 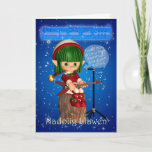 Alternatively, click for Breton Christmas cards on Greeting Card Universe! Scroll down for the lyrics to Breton Carol in Breton and in English. Péh trouz zou ar en doar? Péh kan a gleúan me? Eled, lavaret d’emb eit petra e kannet? Peneú éted ar zé e zou arriú er bed? Arnet eúe genemb kannet pobl ag en doar? What is this noise on earth? What is the song I hear? Beautiful voices filling the sky! Angels, tell us: why are you singing? What is new in the world? Is born in the town of Bethlehem. Kernow is the Celtic country at the very south-west of the British mainland. It's on a peninsula pointing out into the Celtic Sea. Famous for pasties, surfing, tin-mining and tourism, when the Cornish export something, you know it's been exported. Never heard of them? I warrant that you have spotted their influence. St Patrick (of parades in New York and patron saint of Ireland fame) was a Cornishman. It was Cornish miners who introduced football into Mexico. In 2012, Britain was practically in an uprising, because the government attempted to put a tax on Cornish pasties. It backed down. So yes, Cornwall may be tiny - and may have come under even more pressure than even the rest of the Celtic countries to become English - but it certainly makes its presence felt! Do you know any of the beautiful Kernewek? 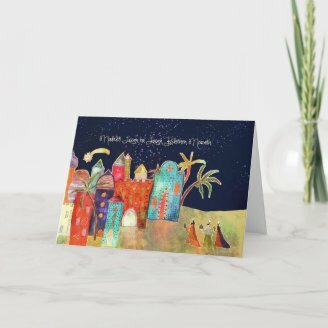 This Christmas wish them a Nadelik Lowen with your Cornish greeting card. What is Merry Christmas in Cornish? 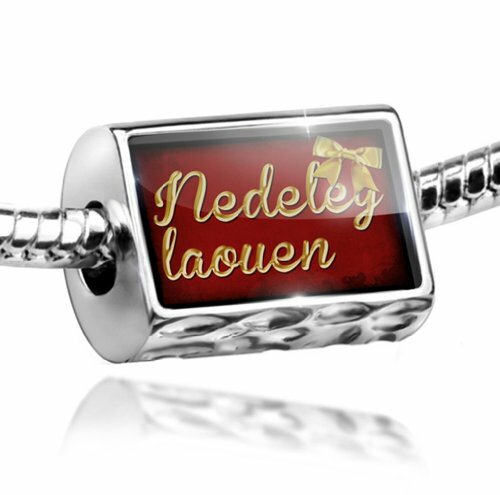 There is an alternative spelling of Nadelik Looan. And an alternative spelling of Looan Bethen Noweth. 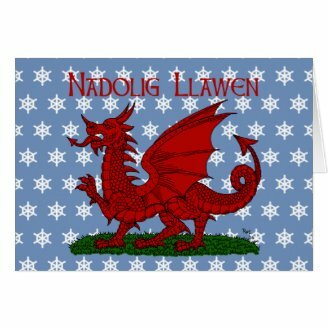 Nadelik Lowen ha Blydhen Nowydh Da = Merry Christmas and a Happy New Year. Most of the available cards appear to favor the alternative spelling, but my Cornish dictionary and a couple of internet sources are with the highlighted version. How do you pronounce Merry Christmas in Cornish? I hesitated over the 'd', as it's not really there. I went to write 'with', but that's already a word in English and would be wrong. It's pronounced exactly like the measurement 'width'. Maybe 'wyth' might be better. Nad-dell-lick low-wen a blith-en no-width da = Merry Christmas and a Happy New Year. You can hear these phrases and more spoken at Cornish Language Online. Ireland is the most westerly country in Europe. It's the large island to the left of the British mainland. Famous for great parties, ferocious self-preservation, Guinness, U2 and Liam Neeson, not to mention St Patrick's Day and the whole saving Christianity after the fall of Rome thing. I doubt that the Irish need any introduction. The Celtic tiger has roared across the entire known world! These Gaelic people were the first Celtic people to colonize the British Isles after the thawing of the Ice Age. They sailed up from Ibernia (think Spain and Portugal) and made homes all along the coast of the Irish Sea. The Scotti came from Ireland by the way. The original Scots were Pictish, so there is a strong argument that Scotland is actually an ancient Irish colony. But not one which I'd wish to make in a pub in Glasgow. Know any gorgeous Irish Gaels? 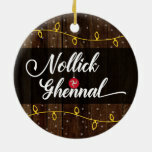 Wish them a Nollaig Shona Dhuit in your Christmas greeting card this year. 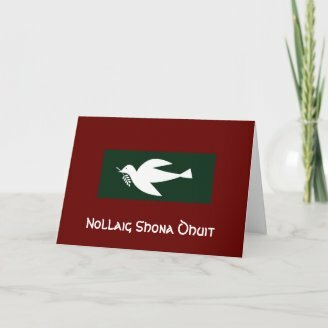 Christmas greetings in the Irish language. 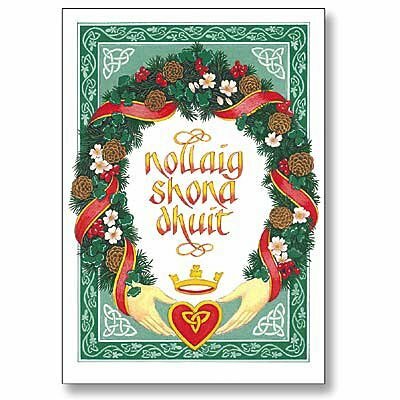 What is Merry Christmas in Irish Gaelic? By multiple, I mean two or more. How do you pronounce Merry Christmas in Irish Gaelic? That last word has a kind of 'h' sound at the beginning of it, like a soft hwich. I've searched the internet for inspiration and found everything from 'ghwich' through to 'ditch' trying to cover it. There are further complications in that there are different accents depending on where you are in Ireland! Av-leen foee Vah-sha-dut = Happy New Year. You can hear these phrases and more spoken at Irish Gaelic Translator.com. 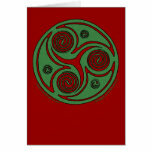 The Irish Gaelic Christmas message is inside some of these festive Celtic cards. Would Ireland have Rebelled if Guy Fawkes had Blown Up Parliament? What might have been the response of the Irish, if Guido Faukes had successfully exploded the House of Lords in 1605? Ellan Vannin is a Celtic country, which is located on an island in the middle of the Irish Sea. Famous for tail-less cats, the Bee Gees, motorbike racing and Geraldine Somerville (that's Lily Potter, mother of Harry, for most of us), the good people of the Isle of Man have made their mark on global culture. While fundamentally Gaelic Celts, the Vikings did bump their long-ships along that coast too. The poor Manx started off as Brythonic Celts (same as the Bretons, Cornish and Welsh), but got taken over by the Irish Gaels, invaded by the Norse, then ruled by Scotland, before the English slapped their crown onto the passports. That's what you get for being a tiny island nation in the middle of the Irish Sea. In fact, it seems that the only ones to leave the sweet Vanninnagh alone are Amazon and Zazzle! At least insofar as Manx Gailck greeting cards are involved. Which was the case until I became creative in GIMP and produced the card above! I couldn't leave my Celtic brothers and sisters unrepresented in those places. Y croeso, Vanninnagh. 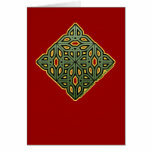 In addition, Greetings Cards Universe has three seasonal cards to say Happy Christmas in Manx Gaelic. Unfortunately I have no lyrics for it, nor any Manx Gailck to translate it. But it's a Christmas carol about Bethlehem, I warrant the Nativity gets a mention. What is Merry Christmas in Manx Gaelic? Nollick Ghennal as Blein Vie Noa = Merry Christmas and a Happy New Year. How do you pronounce Merry Christmas in Manx Gaelic? The 'g' in ghennal is found in the back of your throat. It's not a sound which is found in English at all. I really don't know how to reproduce it phonetically; but you're not going to be kicked out of any establishment in Douglas for not getting it precisely right. 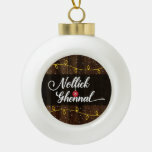 Noll-ick genn-ul as Blen vy noah = Merry Christmas and a Happy New Year. 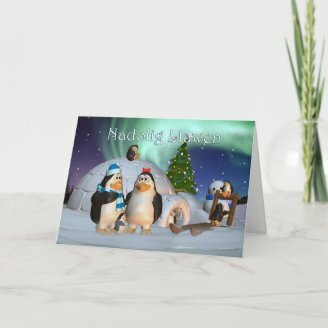 Unfortunately it appears that not a single Vanninnagh has recorded their Christmas greeting and put it onto the internet. Everyone please glare in the general direction of Man, until one of them buys a microphone. Alba is the northern-most Celtic country on the British mainland. Famous for whisky, Highlanders in kilts, tartan, Sean Connery, Maggie Smith and the Proclaimers, the Scottish also invented just about every useful thing in the 20th century (barring the internet). They are responsible for the airplanes in the sky, bicycle in your hallway, the tyres on your car, the phone in your hand, the television in your living room and the macadamisation on your roads. But not Tarmac. It's a common misconception that Tarmac has anything to do with the Gaels. It was invented by a Welshman. Do you know any great Scottish Gaels? 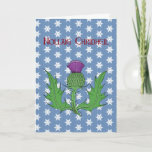 Then wish them a Nollaig Chridheil with your Christmas greeting card. What is Merry Christmas in Scottish Gaelic? How do you pronounce Merry Christmas in Scottish Gaelic? 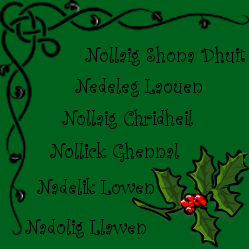 Noll-leg Chree-yell ugus blee-hanna var uwr = Merry Christmas and a Happy New Year. Christmas greetings in the Scottish language. Cymru is the Celtic country which bulges out, on the western central coast, of the British mainland. Famous for male voice choirs, Katherine Jenkins, Tom Jones, Shirley Bassey and the Manic Street Preachers, the Welsh have a deserved reputation as living in the Land of Song. However, we also gave the world the Arthurian legends, Bertrand Russell, love spoons, the poetry of Dylan Thomas and Taliesin, and meteorology. Oh! And X-Rays. And Tarmac. Wales is a beautiful country. My lot are all from the south and east - the parts which gave the Romans, then the Saxons all of that trouble. (Bless the poor Romans, they ended up having to build a whole port down in Caerleon, just to try and tame the Silurians. Tra-la-la.) But the rest of the country is stunning too. I defy anyone to wander through the Llanberis Pass without a look of sheer wonder on their faces. Do you know any cute Cymry? 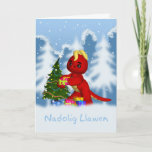 Then wish me a Nadolig Llawen in your Christmas card this year! 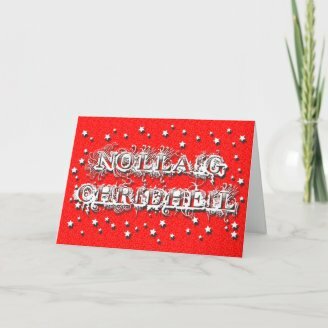 Christmas greetings in the Welsh language. What is Merry Christmas in Welsh? Nadolig Llawen a Blwyddyn Newydd Dda = Merry Christmas and a Happy New Year. How do you pronounce Merry Christmas in Welsh? There is nothing better guaranteed to frighten an English speaker than 'Ll' and 'Dd' in Welsh. Yippee! We have them both amply represented here. Ll = Put the tip of your tongue against the back of your top front teeth. Now just breathe. That is the sound for 'll'. You don't have to even attempt a sound. Just breathe. That's all it is. Dd = Say 'th'. It's the same 'th' as at the beginning of 'the'. In fact, say 'the'! You've got it! Yay! See the notes for the same 'wyth' sound in the Cornish version. They're practically the same language, hence I ran into the same difficulty in rendering the sound. 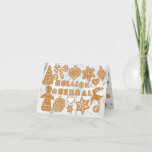 Na-dol-lig Ll-ow-wen ah bloo-width-then new-width tha = Merry Christmas and a Happy New Year! Does Christmas mean taffy and a visit from Sion Corn in your home? 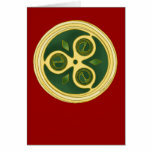 Then indulge that hiraeth by picking out some Celtic Christmas ornaments from Wales. Thank you very much, Barb! And I do hope so. This is beautifully laid out. I'm sure anyone needing Celtic cards would not leave empty-handed.